Scandinavian style decor can be a wonderful way to decorate your home. 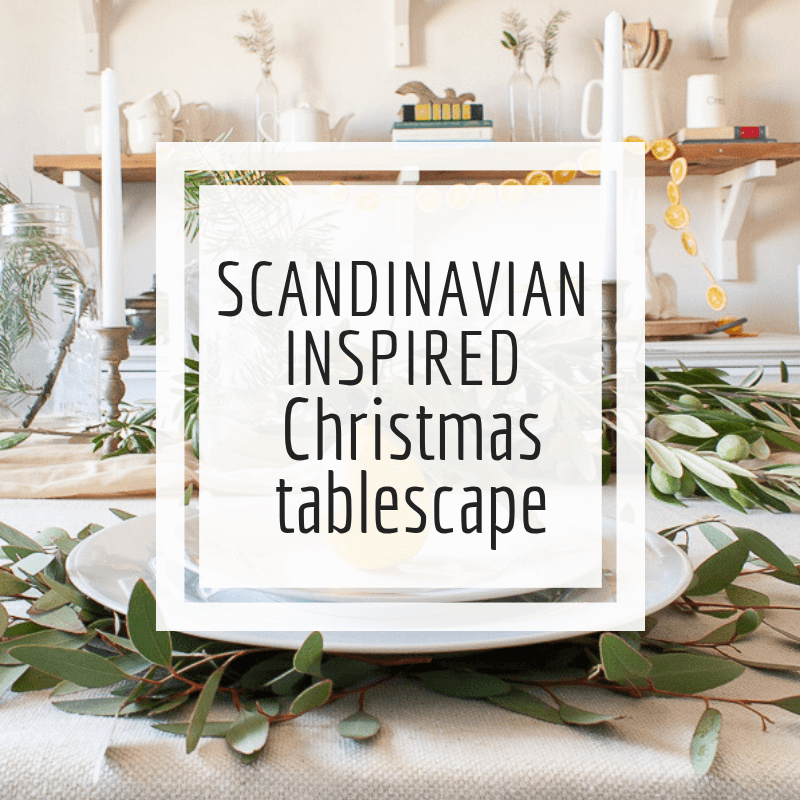 Do you want to see how I created a serene and Scandi inspired Christmas tablescape? This is one of my favorites! 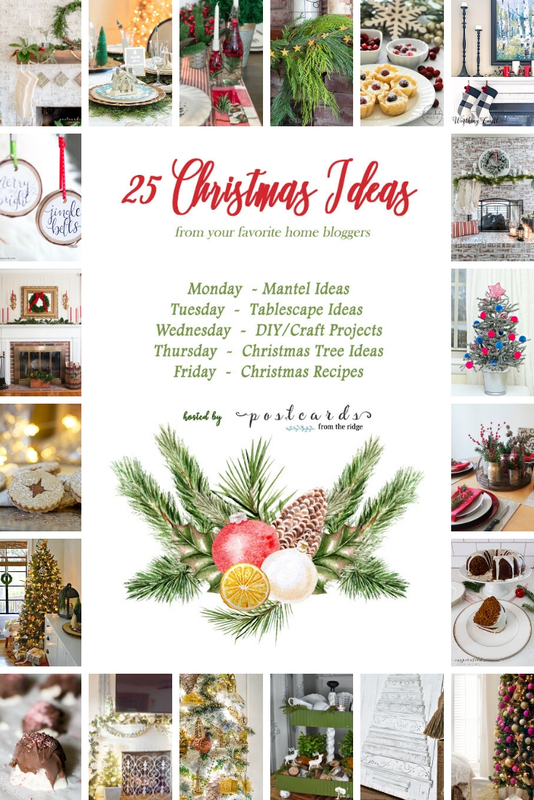 I am excited to be participating in a fun blog hop this week and I am taking part with my Scandinavian inspired Christmas tablescape. Thank you to Angie from Postcard from the Ridge for putting the whole thing together! Make sure to get to the bottom of the post where you can see the full weeks schedule! Now lets get to my table! These are just a few of the elements I wanted to add to my Scandinavian style Christmas tablescape. And….I did this all with items from my home! Or…..my sisters home. Let me explain. I have really wanted to create a very handmade Christmas this year. There is something about being able to create a whole new look without spending any money that satisfies me. I mean, we all know we have plenty to spend out precious dollars on this month. I think that after a year of constantly designing and decorating I really wanted to simplify this Christmas. This means I had to do a lot ALOT of editing. One thing I notice about Scandinavian design is that it seems as if each and every element or decor piece is picked very carefully and they are strategically placed int he best spot. 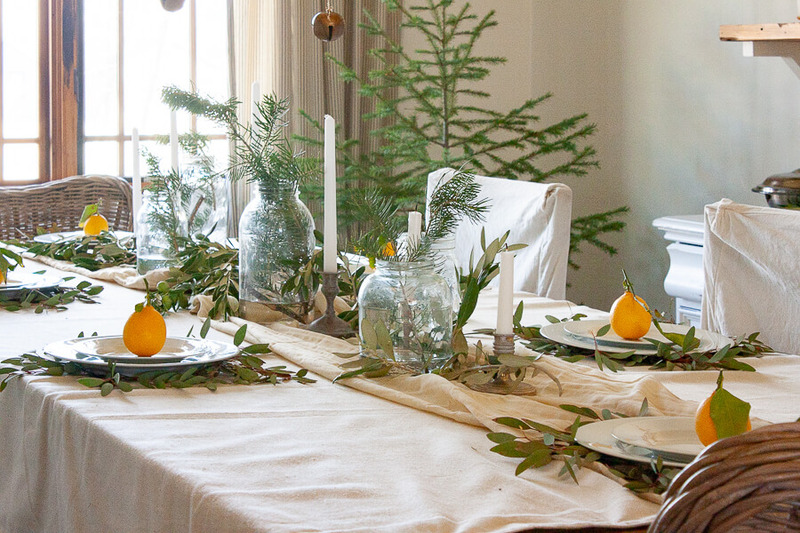 For my Scandinavian style Christmas tablescape I wanted to start fresh. I wanted the look of a linen tablecloth, but alas I did not have one…but what I did have was a large sheet of dropcloth fabric. 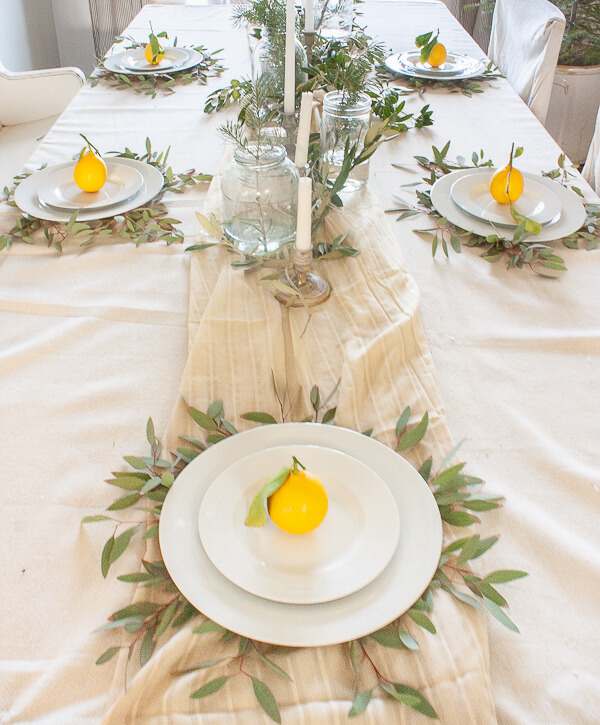 The dropcloth definitely gives the look and feel of a linen tablecloth without the cost. I used a piece of thinner fabric as a table runner to break up the dropcloth and add a bit of a soft touch. I always like to add a charger or some kind of focal point under my plates. My sister brought a huge bin of olive branches and Eucalyptus when she came for Thanksgiving. I was so thrilled. I knew I wanted to use the Eucalyptus under the plates. It is simple and nature inspired. Just what I wanted. 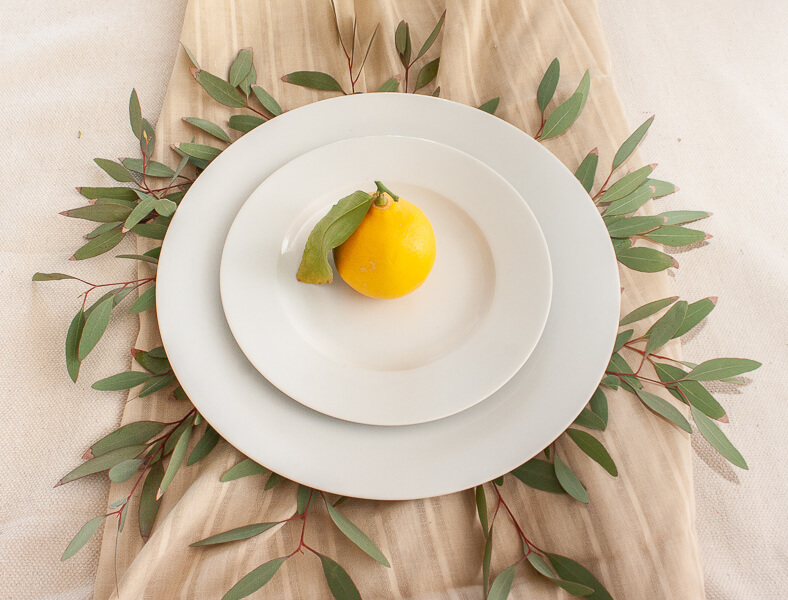 The only thing I wanted to accessorize the plates with a single lemon from my sisters lemon tree. 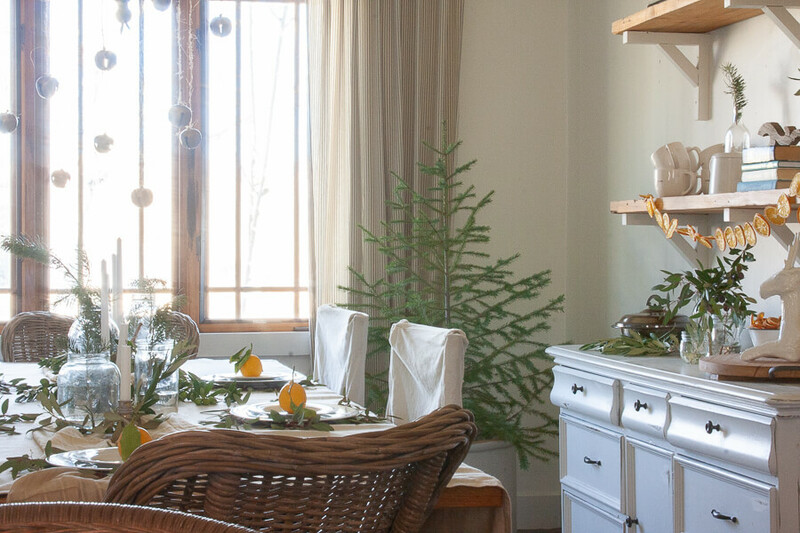 Scandinavian Christmas design often uses fruits in their decor…as decor. Its amazing how a simple thing like a piece of fruit can really make a table pop. I filled clear jars with some water and then added pine tree clippings. These clippings came from our Christmas tree this year. We always go out and cut our own tree down and the extra clippings always come in handy. In the center of the table, I used a collection of candles. I have a huge collection of candlesticks that I saved from the trash bin and they have come in so handy! More of them were used in my Scandinavian inspired Christmas mantel earlier this week. The addition of bits and pieces of olive branches and Eucalyptus adds more interest around the candlesticks and glass bottles. This may not seem like the traditional red, green and white Christmas style, but my gosh I am a fan of the simplicity and I think that trying out new styles is what makes a grow and learn. And that pop of yellow from the lemons….I had no idea I was going to like that. Each and every piece I put on the table was laid there with care. I wanted each item to have a place and serve its purpose. I love that these olive branches still actually have olives on them! Isn’t it so fun? This Scandinavian style Christmas tablescape was so very easy to create and I was able to do it without buying a bunch of fancy pieces. It was scrounged and collected. Here is a peek at what the rest of my dining room looks like with the table all set. Can you believe how adorable that tree is in the background? There is nothing like a fresh cut tree. Nothing….I tell you. Have I told you how hard this space is to photograph? It has one large window that always gets int he way when I am trying to take a good photo. The light is wonderful, but it also can be difficult to deal with. The last thing I did to add a bit more Scandinavian decor is that I hung brass bells from the chandelier in the room. I used simple twine to tie them and alternated their lengths. What do you think? 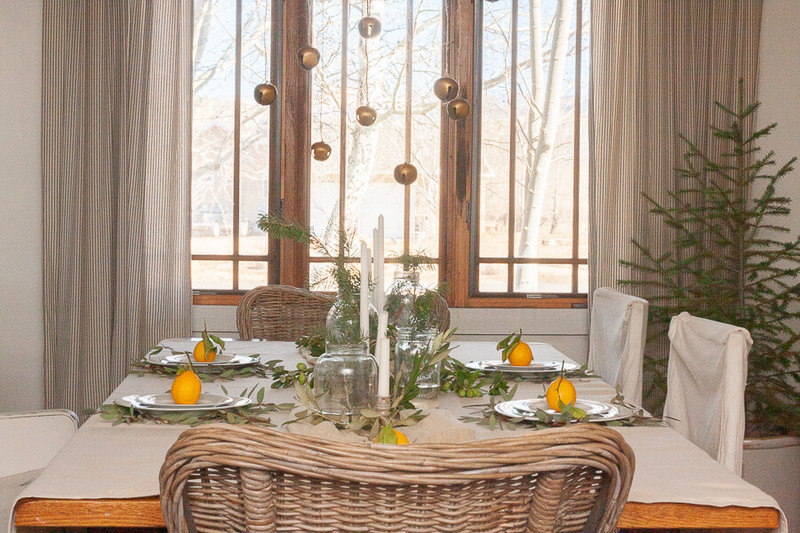 Did I pull of a Scandinavian style Christmas table? I like to think that this is my take and that I was inspired by the Scandinavian decor to bring my own twist to it. « Why I’m Excited About the Paypal Cash In and Cash Out at Walmart! OMG Sara! You definitely pulled off the look and vibe! 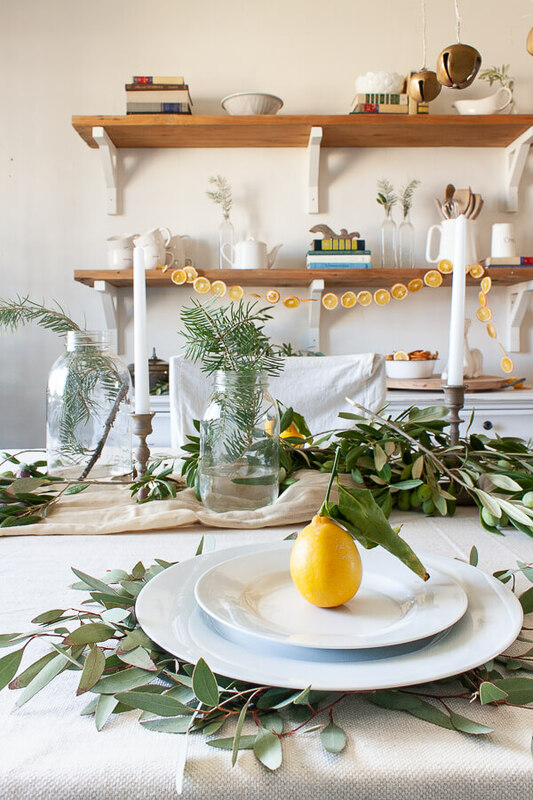 Is it bad to say that we are a tad jealous of the fresh lemons and olive branches? LOL Your table is absolutely festive and ready for the holidays. Just gorgeous! I am loving all the scandinavian and norwegian inspiration this year. The olive branches and eucalyptus have to be my favorite part. Love this fresh, simple style! 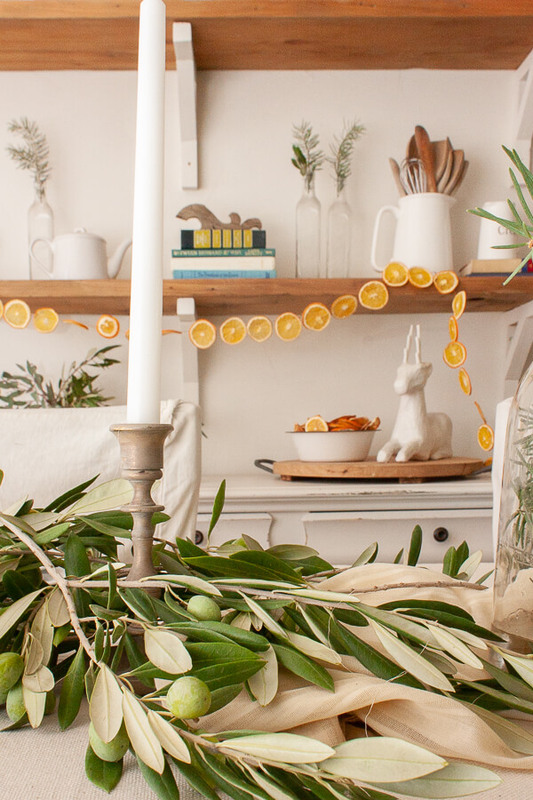 The yellow does add that pop of color that turns the room into something festive, and I love the orange slice garland! And yes…my dining room has a big bay window; oh the photo challenge! 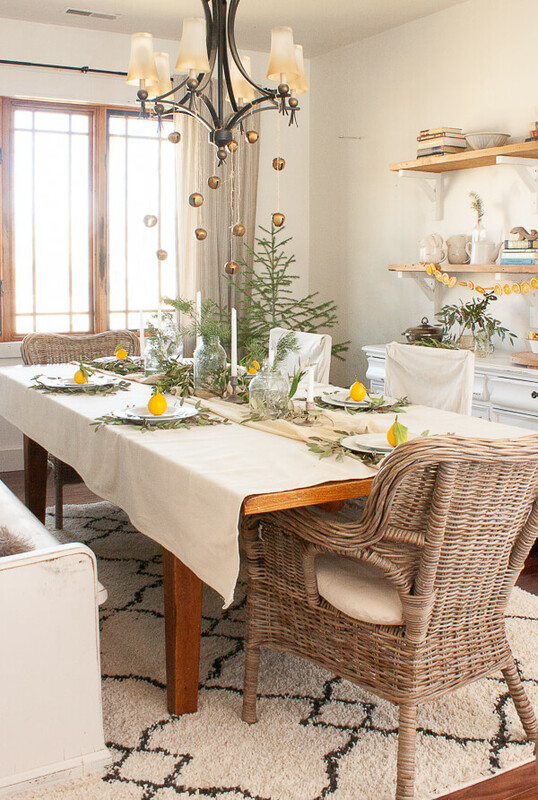 Sara, I love your simple but so elegant tablescape! It’s just perfect! You have a beautiful table setting and the simpleness makes it really lovely. Thanks, what i wonderful scent. 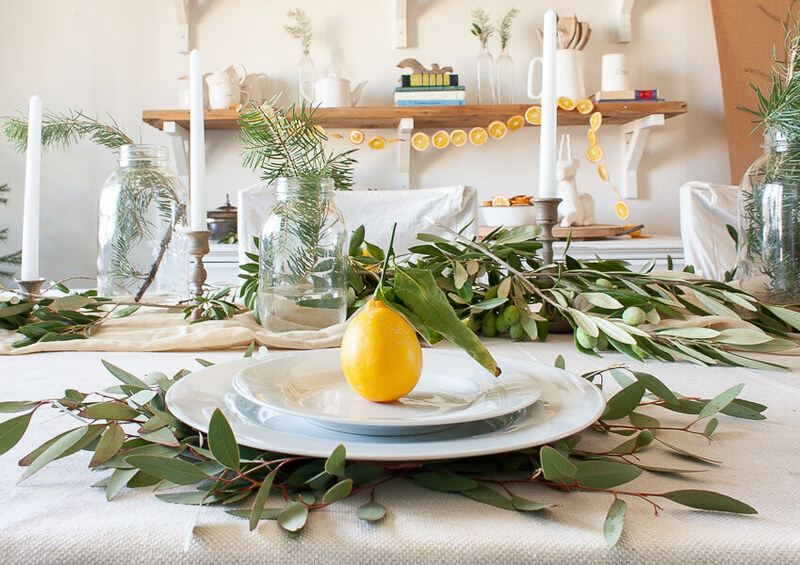 I love the simple beauty of your tablescape! 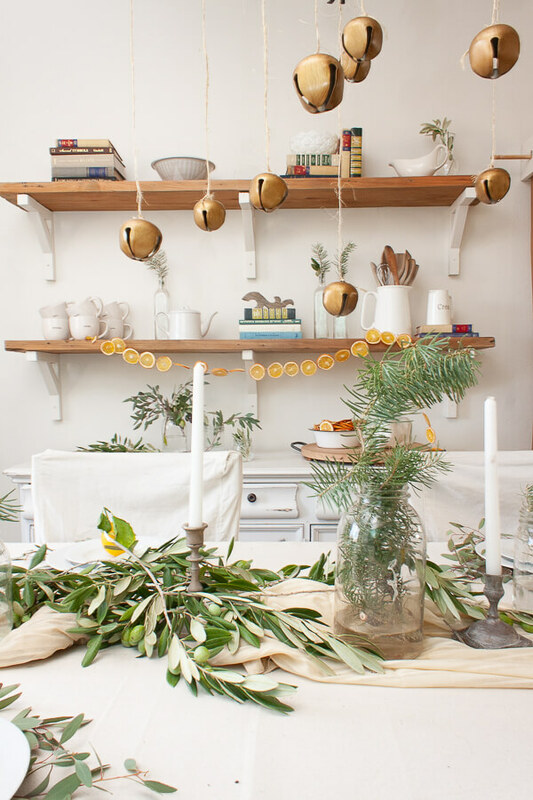 I love everything about this tablescape! I’m all about simple and I love the pop of yellow from the lemons. It’s so unexpected and so pretty! 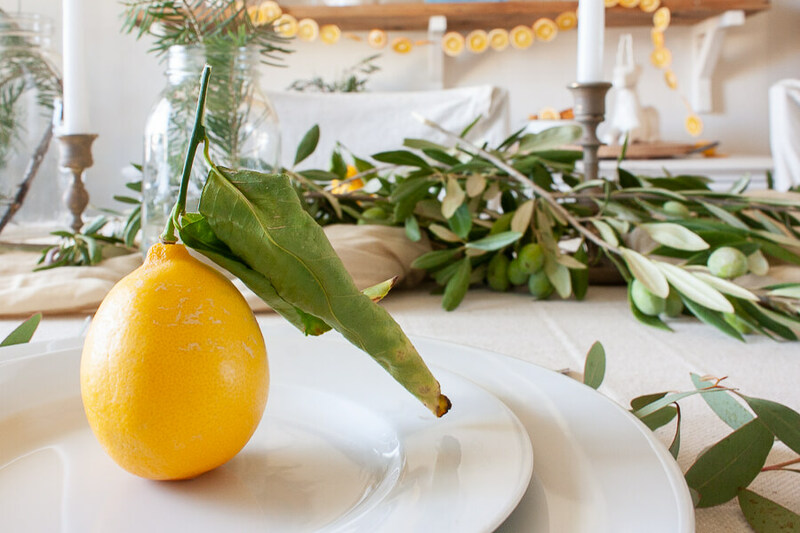 Sara…how lucky you are to have lemons and olives this time of the year! Your table is absolutely perfect…simple and calm. And I do love that charming little tree in the corner. You are all set for a lovely meal. What a beautiful space, Sara! It all looks so lovely and fresh.